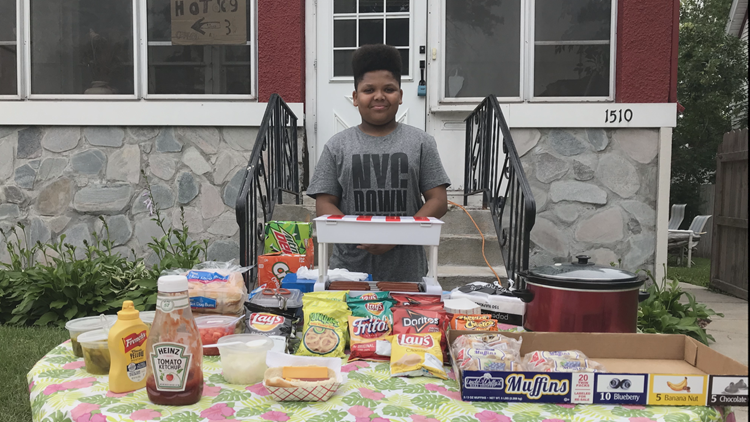 A young entrepreneur is now running a city-approved hot dog stand. MINNEAPOLIS - A 13-year-old's summer hot dog stand is now officially permitted by the city of Minneapolis. Located at 1510 Penn Avenue North, Mr. Faulkner's Old Fashioned Hot Dogs received a lot of support after officers with "Bike Cops for Kids" encouraged people on Facebook to visit his stand. Faulkner first started his summer hot dog stand in 2016, with the help of his uncle. He took a break last year but was determined to do it again this year. "It puts pride in me to see that I'm doing something good for the community," Faulkner told KARE 11 back in June. "They worked with a couple groups in the area, NEON I know was involved, Appetite for Change, trying to support Jaequan and what he's doing. He's a great kid," Ebeling said. Staff from the Minneapolis Health Department, the Minneapolis Promise Zone and the Northside Economic Opportunity Network (NEON) came together to help bring Faulkner's hot dog stand up to code. "We've been working with Jaequan on the business side of things, like basic business, finance, marketing, pricing... he's really been excited about all of it," said Ann Fix, program manager for the Northside Food Business Incubaor through NEON and Appetite for Change. "I pay me and my uncle and my cousin... but before I do any of that I pay tax," Faulkner said. "Surprisingly, I'm like, dang the city's not the bad guys in this situation. They're actually the ones who are helping me," Faulkner said. "It makes me feel kind of—not kind of—really proud that people know what I'm doing." Monday was Faulkner's first day operating with a permit. The move could also help future young entrepreneurs. "So all of this conversation now has gone into what resources can we put to help teens," Fix said. Faulkner hopes to earn enough money to buy a food cart for next summer. "So the next few weeks we're just going to get him through this short-term food journey and then school starts and he's very, very focused and excited for school to start. Then in the fall and winter we'll start really strategizing and planning out to get his food cart," Fix said. Faulkner has a special event food permit that lasts 10 days at the 1510 Penn Avenue North location. He's open 11 a.m. to 3 p.m. He will then be setting up his food stand at different sites around the North Side including the 4th Precinct, the Urban League and Sanctuary Covenant Church. Faulkner added, "It's not about the money. It's just something I enjoy doing." You can follow his stops through his Facebook page.